Dedham Square improvements include pay stations that cater to people running quick errands. Amy Haelsen has some war stories about the old intersection of High and Washington streets in Dedham Square. Before the completion of the Dedham Square improvement project late last year, the intersection, absent of any signal lights, was like a dangerous game of Frogger, with pedestrians and cyclists weaving and dodging away from motorists more focused on finding a place to park than on the road ahead, she said. For many, the obvious culprit was the lack of parking. Except it was not. A parking study found that between on-street spots and municipal lots, Dedham Square actually had plenty of parking, but it was not being managed properly. 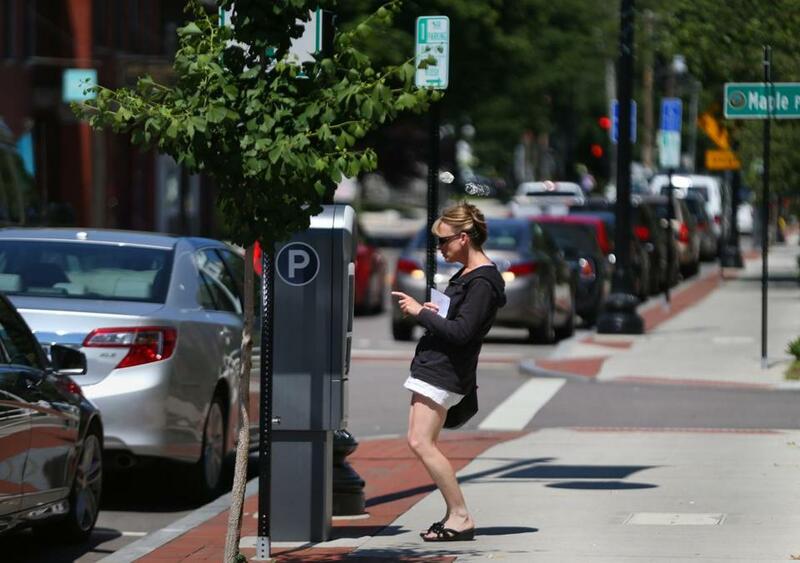 Like Dedham, an increasing number of suburbs, including Hudson, Salem, Belmont, and Stoughton, are turning to the parking study as a key to revitalizing struggling centers, and addressing gridlock at vibrant downtown destinations. Burdensome residential parking requirements that can restrict new development in town centers are being revisited, while the mentality of building parking structures or paving over valuable land to create surface lots is slowly giving way to more creative solutions to manage existing parking space, said Jessica Robertson, transportation coordinator for the Metropolitan Area Planning Council , a regional planning agency serving 101 cities and towns in Greater Boston. Although one parking plan does not fit all, Robertson said that in most suburban communities the lack of parking is more likely a perception than an actual problem. Haelsen, who is executive director of Dedham Square Circle , a downtown preservation nonprofit, said she was nearly struck while crossing the intersection on a couple of occasions, and has local friends who would nix plans to take their children out for ice cream and elsewhere unless they found parking on the same side of the street as where they wanted to go. “It was like the Indy 500. If you were on the crosswalk, you were like a sitting duck,” she said. Improvements in Dedham Square included getting rid of the paid permit requirement in one lot and turning it into free public parking, as well as replacing old-fashioned meters with electronic pay stations that cater to people running quick errands by allowing them to park free for the first 15 minutes, but restricting the maximum length of parking to one hour, capped at 75 cents. The changes have been good for small businesses, said Cheryl Doucette, assistant manager at The Blue Bunny bookstore. But improving the pedestrian experience by adding signal lights and widening sidewalks, among a number of other tweaks, is also playing a crucial part in making parking available as more people buy into the idea of walking, said Richard J. McCarthy Jr., Dedham’s planning director. Communities that have undergone parking studies have implemented solutions like increasing the cost of parking along main commercial streets, and maintaining free or reduced-price parking a block or two away from main commercial areas. Those minor adjustments, Robertson said, ensure steady turnover of coveted Main Street spots during peak hours, and entice people who need to park for longer periods of time to seek spots a few blocks away from their destination by offering cheaper rates and longer time limits. Despite having a number of parking garages and lots, one of the most common complaints about downtown Salem was that there was not sufficient parking, said Lynn Duncan, the city’s director of planning and community development. A parking study revealed that while parking was plentiful in the garages, including one that was 50 percent vacant, cheap on-street parking in the bustling downtown area was overused. In 2011, city officials adopted a comprehensive parking plan that kept the cost per hour at garages low, while creating different pricing levels at on-street parking meters ranging from $1.50 per hour along busy streets, like Federal and Church streets near the courts and commuter rail station, down to 50 and 75 cents per hour in the outskirts. Increasing meter prices along the most popular areas has ensured downtown Salem maintains a recommended on-street parking availability rate of 15 percent, or about one vacant space per eight spots, which is roughly one empty spot per block, Duncan said. In addition to the tiered pricing, the city extended meter time limits to four hours to encourage people to shop and dine without rushing or being concerned they will get a citation. Downtown employees are also encouraged to buy monthly garage passes at a discount to discourage them from using valuable on-street parking, she said. While revenue from parking has remained neutral since the changes were adopted, citations have gone down, Duncan said. Like Salem, the goal for many communities restructuring their parking management plans is not to penalize residents and visitors with parking tickets, but to make it easier for them to find parking appropriate to their needs while doing business downtown. Addressing the town center parking conundrum is at the heart of all the elements surrounding smart growth and the very reason Hudson has begun its own downtown parking study, said Michelle Ciccolo, community development director. Downtown Hudson has become something of a restaurant destination, increasing the need for parking on nights and weekends, Ciccolo said. But more urgently, some studies have suggested that once nearby Highland Commons shopping center is fully occupied, the downtown rotary will become so much more congested than it currently is that it would garner a failing grade, she said. If it is changed to a two-lane rotary, or replaced with a traffic light, downtown Hudson could lose 32 parking spaces, she said. As part of the study, residents and visitors to downtown Hudson are being asked to participate in a survey about parking activity downtown and preferences for improvements, including whether the town’s goal of adding more residential development above existing one-story commercial structures downtown should be contingent on parking requirements. Robertson, of the Metropolitan Area Planning Council, said as more people desire to move back to town centers and downtown areas, town officials should consider relaxing residential parking requirements. A survey of municipalities in the planning council’s region found that 63 percent have parking requirements that are higher than the current vehicle ownership rate. Only 6 percent required fewer parking spaces than would be needed by the average household. Parking, she said, is a hot topic, evidenced by the 350 attendees to a Metropolitan Area Planning Council’s conference on parking, held in Boston in April. “One of the big revelations people came away with is shifting how you think about parking as something that’s necessary — a predetermined amount to anything — to one of the different ways you can use your urban space,” Robertson said. ■63 percent of municipalities in the Metropolitan Area Planning Council region have residential parking requirements that exceed the average vehicle ownership per household. ■Salem: increased the rates of meters in busy downtown areas from 50 cents per hour to 75 cents to $1.50 per hour to encourage turnover. People who need to park all day, such as employees, have access to $25 monthly passes good at some on-street and parking-lot spots, and $65 monthly passes for garage parking. ■ Dedham: improved the pedestrian experience by adding 12 new bike racks and 43 ornamental street lights, and reducing the length of a dangerous crosswalk from 693 feet to 494 feet. After construction, Dedham Square gained 24 parking spaces, for a total of 115 on-street and 138 lot spaces. 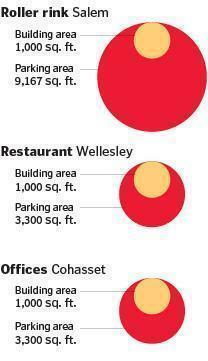 ■ Hudson: surveyed about 60 residents on the town’s master plan and residents identified downtown parking as the second-greatest challenge facing the town after downtown vacancies. Main Street/Route 62, the heart of the downtown, carries approximately 10,000 vehicles per day.